As dog owners we often promote the wrong habits in our dogs. Bad habits remain as bad habits if they are not corrected. A dog that is allowed to jump up on you because he is a puppy will not understand why he is not allowed to jump up on people when he is a larger adult dog. Establish rules and limits today designed for tomorrow. 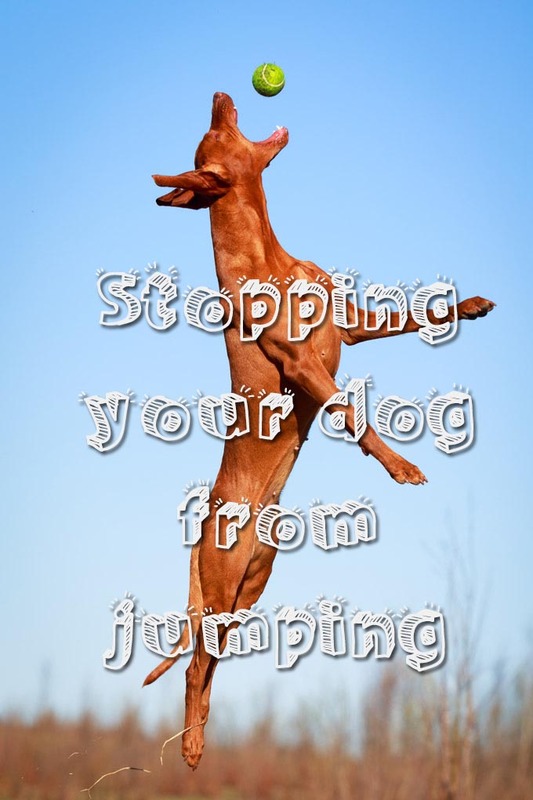 A dog jumping up on someone can be a safety issue. A large dog jumping on an elderly person or young child is especially dangerous. It is not your dog’s intent to hurt anyone when jumping up. He simply sees it as a way to greet people because it was allowed when he was a puppy. One way to teach your dog not to jump up is to position your arms in front of your body. This will keep your dog from completing his jump. Follow this action with a stern vocal NO then immediately turn your back on your dog. Don’t allow your dog to make eye contact with you. When your dog has calmed down reengage him and enthusiastically praise him for being calm. Your dog is always seeking your attention and love. By rejecting your dog in this manner you are giving him the opposite reaction that he desires. Within a dog pack the alpha leader communicates his displeasure by correcting inappropriate behavior. As you interact with your dog you must exhibit alpha leader qualities at all times. You dog needs limitations and controls. He wants to be a responsible member of your family and is happy when complying with the expectations of his alpha leader. When you have been away from home for several hours your dog is excited to see you and will often jump up to greet you. To prevent this behavior don’t greet your dog immediately upon your arrival home. You should wait 10 to 15 minutes before greeting him. Until your dog is used to this procedure you may have to put him in another room for 10 minutes or more. It is important to greet your dog with enthusiasm after this calming down period. You must be consistent in teaching your dog new behavior. Being consistent is a major part of dog training. It is important to reward your dog’s positive actions while ignoring his negative actions. When you have to reprimand your dog for negative behavior make sure you take the opportunity to praise him for a positive action. Your final communication with your dog should be loving, enthusiastic praise. Train a puppy is much easier than retraining a full grown dog. The training technique is the same but the physical effort to stop or control an adult dog is greater. Dog training will be an enjoyable experience for both you and your dog, no matter the age of your dog, if you are consistent with your training.